If Sega CD excels at anything, it’s certainly not full-motion video. Right from the beginning, it presented video in scrawny rectangular boxes in the middle of your screen, pixilated and colorless, and so often intertwined with hideously compressed sound that occasionally wasn’t synced correctly. In that sense, Microcosm is a landmark achievement! As a game, Microcosm is a fascinating, surreal experience. The storyline is not intensely original, but it is still cool to think about. The game opens up not revealing much at all. A reading through the manual would probably make things clearer. 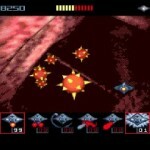 The introduction sequence is breathtaking for Sega CD! It’s a blending together of computer animation and actual video of movie actors. And the combination of the two is seamless. The video quality is a little foggy, but it has a very artistic, comic book-like fuzziness that actually pleases the eye and makes Microcosm one of those games I don’t skip the intro of. You’re gazing upon a futuristic metropolis, comparable to the likes of Blade Runner, and a casual glance of a newspaper inside a vending machine suggests that there are two high-tech companies that are in a technological race for control over something. The view is taken atop a towering skyscraper that is heavily guarded by armed soldiers and walking mech vehicles. In flies what looks like an emergency helicopter dropping off someone who needs immediate help. We’re then taken inside the building, computers, x-ray images, and gizmos galore around a doctor who is about to inject what we find to be a miniaturized spaceship into the cephalic vein of an unknown person. Some of the other details of this interaction I’ll leave for you to watch. Once the strange and interesting cut scene finally ends, you’re taken to the game’s title screen, which contains simply a game start feature and a password screen to use for seeing other levels. At this point, I have to say that Microcosm’s strong point is a tie between the excellent video quality of the cut scenes and its haunting sci-fi music. The game even features an alternate soundtrack on the game CD itself (perhaps music from the PC version). 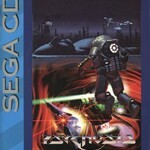 Not surprisingly, however, the gameplay itself is typical for a Sega CD FMV title. The developers placed a sprite-animated spaceship over full-motion video content, hoping that it looks impressive. In this case, IT DOES! Basically, the premise is that you’re a miniaturized pilot inside a spaceship going through the various veins, organs, and body parts of the game’s victim, trying to destroy the various mechanical intruders that have somehow found their way inside of him. It basically has the makings of an arcade shooter, with various stages of gameplay featuring tons of small enemies, larger enemies, and a grand high boss at the end of a level. I have to say the detail and animation of each enemy, and especially the bosses, is very imaginative and look really amazing for the SEGA CD. The top reason I love playing this is simply to see all the animated atrocities that attack me during gameplay. Getting back to the gameplay, you basically move your sprite spaceship around the screen, much like a cross-hair, shooting your unlimited ammo at the many creatures and anomalies that fly all around you. Some things that come your way are also natural body waste and projectiles (GROSS!) and the challenge never lets up. The background video is not inspired but very immersive. You definitely feel as if you’re flying through the bowels and veins of a human being and hitting everything is near impossible so you will have to use a mixture of good aiming and maneuvering. Little power-up icons will sometimes fly at the screen which you’ll have to catch to upgrade your weapons. The possible choices are double shots, smart bombs, three-way shots, and a few others. They’re mostly all just variations of the single shot weapon, but some of them are vital for surviving some of the bosses. Microcosm is recommendable by me for these reasons. It’s a full-motion-video game, yes, but it’s not like any one before it. The video quality is actually creatively executed, detailed, vibrant, and seems to almost use the game’s graphics engine instead of simply utilizing video playback (and I think it does!). The music is really great and fits the mood of the game perfectly. It’s eerie at times, it’s moody at others, and it’s upbeat and techno during gameplay. The game is easy to pick up and play and is really fun to look at. It’s one of those titles that I might even like to play with a head mounted display, just to immerse myself further into it. Clearly, Microcosm is not for everyone though. While I find it colorful, graphically interesting, and moody and surreal, every level follows the same cross-hair moving, shoot-’em-up formula. To some that might seem tedious, but to be fair, the game could have used some variety in gameplay instead being so one-dimensional. Still, it fits into the full-motion-video category and in this case, it does the genre proud.